THE PICTURES ABOVE were taken less than five months apart. 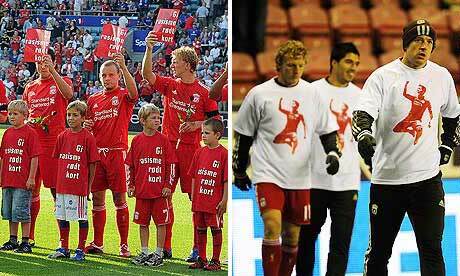 The first shows Liverpool lining up before their pre-season friendly against Valerenga on 1 August, the players holding aloft signs reading “Show Racism the Red Card”, a response to the shooting and bombing attack by the far-right gunman Anders Behring Breivik that killed 77 Norwegians, most of them teenagers, last July. The second is part of the club’s officially sanctioned public response to the decision by the Football Association’s independent tribunal to ban Luis Suárez for eight games after finding him guilty of racially abusing Manchester’s United’s Patrice Evra. The contrast is extreme, the contexts, admittedly, make for a risible comparison. But somewhere between these images is a fault line down which the disconnect between football’s flagship position as a beacon against racism in British society, and what actually happens when a major institution is confronted with evidence of such behaviour in its own ranks, has tumbled this week. It is probably no more than the coincidence of random events that sees two high-profile cases of alleged racial abuse played out alongside each other. Suárez and the accusations against Chelsea’s John Terry are separate if similar incidents and using one to predict the outcome of the other is a speculative dead end. What does and should bear comparison, however, is how both have been handled by the clubs involved from the moment the accusations became public, and how this squares with what has been a consistent and laudable campaign by virtually the entire body politic of British football to eradicate racism, sectarianism and, latterly, Islamophobia from its ranks over the last 20 years. As its players became rich beyond imagination, as its core fanbase found itself priced out of gleaming stadiums, as the oligarchs snaffled up clubs for fun, as the ability to watch games on television was closed to those unwilling to pay through the nose, football’s publicity machine has required a narrative to shield it from well-founded charges that the game’s values have descended to little more than a brazen assault on the pockets of a captive fanbase. Most big clubs run well-established charitable programmes and star players, largely enthusiastically, make themselves available for various hospital visits or publicity events for community projects. But against charges of increased alienation from normal society, football has had need of a well-structured counter-narrative. It is little exaggeration to say that in the past decade, anti-racism campaigns have formed the principal plank of the game’s efforts to present itself as a force for cohesion and solidarity in the often uneasy melting pot of British life. This is not to deride those efforts as a cynical exercise. The atmosphere inside grounds is unrecognisable from the 1980s, where the sense of incipient violence and exclusionary hostility made attending a football match a dangerous proposition for most people of colour, and black players found abuse from the terraces and the thinly veiled prejudice of coaches a constant adversary. Campaigns such as Kick it Out and Show Racism the Red Card would be justifiably enraged at the notion that they are merely part of a fig-leaf to mollify the perception of football’s deeper malaises. Yet unquestionably, in the values of anti-racism the game has found a cause around which all serious participants, from the FA to the Premier League to supporters’ organisations and the clubs themselves, can present a united and progressive front, a face that insists football can be a force for wider good rather than a souped-up version of The X Factor, milking the gullible through its overwrought melodramas. Through the actions of Liverpool and, to a marginally lesser extent, Chelsea, it is that concept which finds itself endangered this week. … the test of any principle comes not in abstract expressions of intent but in how the game reacts when confronted head on, by one and perhaps two of its leading exponents, with the very behaviour it proclaims to abhor. For all the cute mascots in branded T-shirts parading before games, for all the sloganeering, for all that the vast majority of fans are fully signed up, the test of any principle comes not in abstract expressions of intent but in how the game reacts when confronted head on, by one and perhaps two of its leading exponents, with the very behaviour it proclaims to abhor. That the Suárez-Evra incident took place on the same day Kick It Out launched a three-week “One game, one community” action programme and saw both sets of players wear anti-racism T-shirts beforehand underlines the irony. In the immediate aftermath of the game on 15 October, once Evra had made his accusations public via a French TV channel, Liverpool’s position was unambiguous. “Luis is adamant that he has not used language of that nature and the club is totally supportive of the player,” said a spokesman. On 28 October, Kenny Dalglish reaffirmed the club’s backing, albeit accepting that “the guilty party, whether it’s the person who said it or the accuser, should get their due punishment”. Since then, however, the rhetoric has hardened, the presumption of Suárez’s innocence becoming so complete that Liverpool’s extraordinary statement in the aftermath of the verdict was little more than the logical conclusion of the club’s position. Regardless of the guilt or otherwise of those involved, the initial expressions of support from both clubs had in common the unquestioning acceptance of their players’ versions of events, an acceptance that has only hardened with time. Both ruled out the very possibility of guilt, and as far as fans were concerned fully backed the notion that any process capable of convicting the players could only be flawed. In Chelsea’s case, the one redeeming feature has been that the defence of Terry has not rested on a besmirching of Ferdinand, thus at least in theory respecting the Queens Park Rangers player’s right to complain. It is the same right that, in Evra’s case, has been comprehensively ignored by Liverpool. Football’s great weakness of governance has long been its collective inability to adhere to principle when reality proves uncooperative. We are left to wonder what will go through the mind of the next player racially abused by an opponent from a major club, conscious of the knowledge that the full force of an official publicity machine and the unofficial army of keyboard warriors via social media will be mobilised against him without a moment’s regard for consequence.